Wilktone – Page 2 – Jazz, brass, composition, and other things music related. Sarah Paradis is the trombonist with the Mirari Brass Quintet. I was able to watch them give a masterclass a number of years ago which was wonderful. Sarah recently had a son (congratulations, Sarah! ), but some complications forced her to take a long time off from the trombone. She’s doing well now and is back to playing trombone and blogging about her experience taking such a long time off and what it’s going to take for her comeback. Mentally, I didn’t mind too much about this break because I knew it was something I had to do for my health and especially for the health of my baby. It hurt my ego a bit because I couldn’t play with Mirari Brass Quintet, I couldn’t take any gigs, and I missed out on an audition for my local symphony. But again, my family’s health is more important than any gig, so it was clear what I had to do. In this first of what I hope are several posts, Sarah writes a bit about the circumstances that required her to take time off of the horn, what it was like to teach lessons without being able to play, and her plan for further posts on this topic. I’m looking forward to reading more about her experiences and what we can all learn from her. Check back later on the Brass Blog for updates. 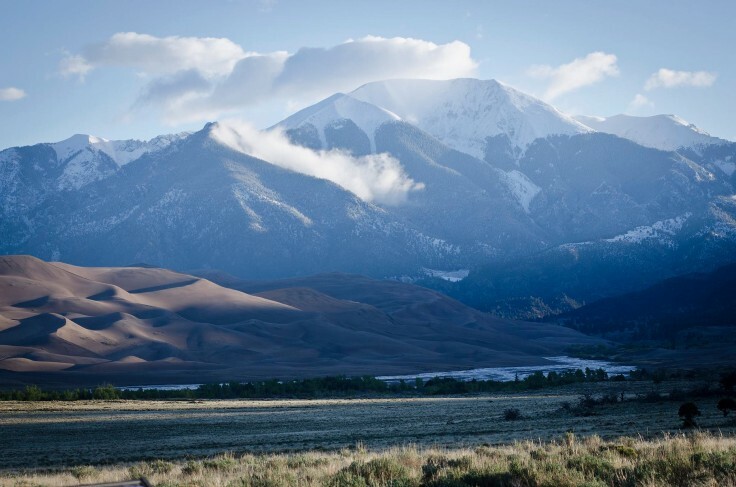 Back when I taught at Adams State College in Alamosa, Colorado I used to go hiking around the Great Sand Dunes National Park. It’s an interesting area, right next to the Sangre de Cristo Mountains in the San Luis Valley. The sand dunes are formed by wind, rather than water. The area was also the home to Native Americans from at least 5,000 years ago. Stone tools discovered by archeologists decades ago were perplexing because while they were clearly made by humans, they didn’t have the correct wear marks on them to indicate that they were used as tools for grinding. Enter archeologist, Marilyn Armagast Martorano. She spent years examining these rocks without coming up with a good explanation. Then someone sent her a video showing lithographs, musical stones. It dawned on Martorano that the stone tools might actually be musical instruments. As it happens, she was probably right. If you’d like to get an idea what these stone musical instruments sounded like, watch here’s a YouTube video. Also, go to the Colorado Public Radio’s page where you can also get the chance to try them out (virtually) yourself. Here’s an interesting video put together by Dr. Richard Smith, a scientist, musician, and instrument maker. In this video he demonstrates something that seems counterintuitive – you don’t have to blow air through the instrument in order for it to function normally. A few years ago I had heard about this experiment and tried to recreate it. I drilled a hole through the cup of an old mouthpiece and tried setting up the membrane to block the air from going through. It didn’t work. Later I came across his technical paper on the topic and learned that I needed to set the membrane up before the shank of the mouthpiece. But it looks like what is really important was to set up a “shank” that directs the air out of the mouthpiece and instrument. It was almost impossible to get the lips to vibrate under these conditions of using a small side hole. However, a solution was found by comparing this acoustical problem with the electrical analogy of a.c./d.c. decoupling – as used in most electronic circuits. This shows that a resistance is needed for the d.c. flow to occur. To provide this resistance acoustically, a narrow tube was placed in the side hole to give enough air resistance for the lips to vibrate against and to enable sustained vibration. Maybe I will have to go back and find that old mouthpiece and see if I can set it up correctly and try it out. It would take more skill (and the proper tools) than I currently possess, but I have a couple of friends that would probably be interested enough in goofing around with it to give me a hand. I came across this video on an online forum devoted to brass pedagogy. Some of the ensuing comments bugged me. Here are some actual quotes from that forum. He is right. Air does not have to travel through the tube. Unfortunately we have a tough time wiggling our lips back and forth 200 and more times per second. I just tried it. Nope. Wait. About 6 per second just now. While this is perhaps a legitimate consideration for the purpose of teaching brass technique, it’s really a straw man complaint. In his video Smith in fact goes out of his way to explicitly state that air is needed to set the lips to vibrate, but the point of his demonstration is the fact that once the air passes the lips there’s no physical law that the air needs to actually move through the instrument in order for it to work normally. Just because you and I can’t think of an immediate pedagogical application of Smith’s demonstration doesn’t mean that there isn’t one. What would be massively helpful is if he didn’t sound like trash doing it the way we all do it. Again, the complaint here does have a bit of validity, but this too is irrelevant to the intention of Smith’s demonstration video. As best as I can tell, Smith’s background is mainly in acoustics and instrument design and construction. For all I know his main instrument may not be any of the instruments he is demonstrating in this video. He may be too busy building instruments and researching acoustics to do much practice these days. In no way does his ability to play a brass instrument negate the factual statements he makes. Personally, I feel that being this dismissive is a shame coming from a teacher. Teachers are supposed to inspire curiosity and creative thinking. The point I made above about not passing judgement just because we don’t think of an immediate relevance to teaching brass applies here. But more importantly, discouraging students from exploring this video also dissuades students from learning about topics other than music. I’ve had and have students who have no intention of going into music as a career path, and some who have even been physics majors. I wonder how one of those students would feel to find me disparaging a factually correct demonstration of acoustics like this. But if you need some practical applications, you don’t have to look very far. Simply pay close attention to what Smith says in his video. He mentions how without needing to blow air through the instrument you wouldn’t need a spit valve or need to clean the instrument out regularly. In the paper Smith recalls how research into the a.c./d.c. effect of brass acoustics has influenced the way in which instruments were tested for design and construction faults. Pedagogical applications of this research are a little harder to think of, but not impossible. One could use the altered mouthpiece sort of like running with small weights strapped to your wrists and feet. Playing exercises or music would require more effort and could potentially be useful for advanced players to build playing endurance. Another thought I had was that if the mouthpiece could be tweaked enough so that it played similarly enough to playing the instrument normally one could design an almost perfectly silent practice mute. Practice mutes tend to be very stuffy and while that can be used in a manner similar to what I just mentioned, it makes relying on a practice mute for long term practice less ideal. Imagine a combination of a practice mute with this type of mouthpiece so that it would feel almost like playing with an open horn while being quiet enough to practice late at night in a hotel room. Here’s an excerpt from a much longer response to Smith’s demonstration video. There are SO MANY OF THEM!!! I’m overdo for another “Guess the Embouchure Type” post. This one is actually quite challenging. Take a look at Sergei Nakariakov performing Carnival of Venice and see if you can guess his embouchure type. MusicWorks Asheville, the El Sistema program I am Program Director for, was featured on a local television morning news program yesterday. I’m very proud of our student, Eric, who was an outstanding spokesperson for us. He got up very early to be there and talk to Lauren Brigman about MusicWorks. Be sure to watch the video towards the end and see Eric teach Lauren how to play the first phrase of Ode to Joy. Having a certain degree of proficiency in reading music notation is considered an important skill for most musicians. If you’re going to perform classical music music literacy is essential. Many of the jazz performances I do require the musicians to sight read charts. If you want to play in a pit orchestra for a musical theater production you will need to know how to read music. In spite of this requirement for these musical endeavors, music literacy appears to be on the decline. I have noticed a phenomenon that seems to be on the rise: an increasing number of applicants auditioning for entrance into undergraduate music programs are unable to read music. Colleagues across the nation, music recruiters, ensemble directors, and theory teachers are all reporting an increasing number of entering music majors who are unable to read music notation and produce music on their major instruments from it. Those auditioning are able to play or sing prepared pieces with performance levels sufficient for admission. However, when they are asked to sight-read musical notation, the results are dreadful. I’ve noticed something similar, not just with undergraduate students but also even many professional musicians. The reasons for this decline are varied, but I believe that some of this trend comes from pressures placed on music educators at the high school level. Consider a typical high school band program. During the fall semester, it’s much more likely that the only band experience the students will have will be marching band. While the music is usually initially learned through sheet music, there isn’t much emphasis placed on reading it. In fact, the goal is to have the music memorized as quickly as possible. Once the music has been learned, the show often emphasizes the drill over the music. While I don’t want to denigrate the hard work that great marching band programs put into their show, these bands typically work the same music for months. There’s not much opportunity for these students to spend time practicing their music reading skills. High school chorus programs are often worse at teaching music literacy. It’s very easy to resort to teaching the music by rote imitation and vocal students often struggle with music notation. It takes some effort on the part of the choir director to help students improve their sight singing. For both the band and choral programs at high school there are also the pressures of contests. Receiving a high rating on a contest is often one of the main ways that music educators will be judged on their teaching by administrators who likely have little to no music education themselves. It can be tempting for the music teacher to teach primarily for the contest and play the same music for a long time, rather than spend time learning new music through notation. When students don’t get much opportunity to practice their reading, they don’t improve. Some of the professional musicians that I’m familiar with also struggle with sight reading. Often times these musicians are very talented players, with good technique and abilities, but they too may spend a lot of their time either performing music that is already learned, learned by rote, or never notated in the first place. It’s a shame, because I enjoy playing with many of these players but so many of the gigs I play and book require good sight reading ability. What can individual musicians do to improve their music literacy? Of course one of the best ways to improve your sight reading is to practice sight reading, there are some other things that players can do to work on reading notation better. Learn scales and chord arpeggios – The trend is to get these memorized as quickly as possible, and while I agree that this is an important goal for all musicians, there’s some value in practicing scales and patterns while reading them. Most tonal music will be made up of scales and chords and it’s useful to be able to visually recognize these patterns. When you’re sight reading a piece of music that has a fragment of a scale you will recognize it faster and spend less time processing it and more time scanning ahead. Follow along with a score while listening to a recording – This is a similar idea to reading scales and chords. You want to make a connection between the visual schema (in this case, the schema is a notated “packet” of musical information) and the aural realization of it. Much like reading text, your eyes and brain quickly skim over words that you’ve read many times and no longer need to slow down to process it. Transcribe music – Jazz musicians use transcription all the time as a tool for learning improvisation. There’s something to be said for memorizing the a solo without resorting to notating it, but by writing it down you’re approaching it from the opposite direction of #2 above. It can be quite difficult to work out rhythmic notation for many musicians, but this process helps you assimilate what the visual representation of that sound looks like on paper. Learn lots of music from notation – I don’t mean to sight read lots of music here, I mean to really learn to play a piece of music. The trouble with practicing sight reading is that the goal is to get through the music, not fix mistakes. By spending time learning to play music from the written page and ensuring that it’s accurate you will learn to make the corrections in your reading that you have to skip over when you’re playing in real time. Learn to recover while reading – There are different ways to approach practicing a piece of music, and they all have some validity. If you’re performing or rehearsing with other players you don’t have the luxury to stop and go back, you need to recover and pick up with your part as quickly as you can. This is why I strongly encourage music students to always finish the phrase you’re playing before you stop and go back to practice a trouble area. If you always stop right after a mistake, you will not develop the ability to recover when a mistake happens in performance. This is sort of the opposite side of the coin from #4 above. You have to be able to continue playing past a mistake, but you also need to go back and learn how to not make the same mistake again. There are other strategies that individual musicians can employ in their practice. There is also some pedagogical research I’ve recently looked at that investigates effective ways to teach music literacy in the classroom. There’s a lot more that can be said about music literacy, but I’d also like to hear your ideas. Do you feel your reading skills are strong enough? What have you done to practice your sight reading skills? What strategies do you employ with your students? Leave your comments below. What Do J.S. Bach and Charlie Parker Have In Common? Rick Beato has a neat YouTube channel he calls Everything Music. I haven’t had the chance yet to watch more than this one, but it’s a really nice discussion about octave displacement. In this episode of Everything Music we will explore what Bach and Charlie Parker had in common which was octave displacement. It is a way for you to make your melodies more interesting and more intervallic. It will also give your lines much more interesting shapes. This web site is pretty neat. The Google Cultural Institute set up a couple 360 degree cameras up on the stage of Carnegie Hall during a performance by the Philadelphia Orchestra. You can choose which camera you want to use and also drag around the angle to watch what you want to. Click on the image below to visit. I ‘ve watched this several times now. I tend to focus mostly on watching the conductor, Maestro Yannick Nézet-Séguin. I think that conducting is much like performing in that it’s necessary to watch and absorb how great conductors express themselves through their gestures and facial expressions. When you’re performing with an ensemble you have to watch the conductor closely, but my mind is always focused on performing rather than studying the conductor. With a video like this you can simply watch. There are some other performances you can view too, including the Berlin Philharmonic in a rehearsal. I posted about this topic a while back, but I recently came across a very nice article by Assaf Dar Sagol called 432 Hz Tuning – Separating Fact From Fiction. 432 Hz. The magic number everybody is talking about. It is said to be the natural frequency of the universe, to have cosmic healing powers and to attract masses of audience to our music. Just by tuning our music less than a semitone below our standard A=440Hz we are promised direct access to the universe’s hidden treasures. There are many articles presenting so-called “scientific evidence” in favor of 432 Hz. But how much of what are being presented with is fact, and how much of it is fiction? Let’s find out! Sagol goes through several myths and claims about 432 Hz being a special note somehow and offers an overview of the actual history and science behind those claims – including linking to his sources. Real history and science are always so much more interesting then pseudo-history and pseudo-science.